Posted in appetizers, Middle Eastern, recipe, savory by Antonio Tahhan on December 17th, 2009. You can follow any responses to this entry through the RSS 2.0 feed. You can leave a response, or trackback from your own site. OMGGGGGGGGGGG I’ve been looking for this recipe for centuries! THANK YOU! This looks like a lighter Aioli – yum! This is the first time I see an “emulsion” with egg whites! What a great idea, thanks so much! Sounds wonderful! I am going to try it with Meyer lemon juice (probably need to add more juice because they are less acidic). Thanks for the recipe! THis is a new version to me using the egg whites, I usually do it like your friend Fouad, I have to try your version and see . Tony you need to add more Toum 3-5 is not enough to give the flavour!!!! KJ: sa7tein–I bookmarked your shawerma post so that I can make chicken shawerma with this sauce. 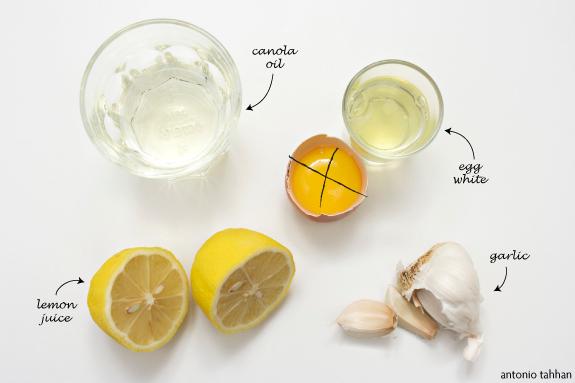 Dragana: I’ve never tried it with Meyer lemon… you’ll have to let me know how it goes! Arlette: Merci! Let me know what you think about the egg white version. I like both versions, but I find myself adding less oil when I use an egg white, which means I can get away with eating more 🙂 You’re right about the garlic–I originally made this recipe with 1/2 cup of oil (instead of 3/4cup) and forgot to adjust the amount of garlic. I’ve adjusted the recipe. Thanks! Tried your recipe today with some home made fried chicken, ABSOLUTELY DELICIOUS!!! Ooooh! This does sound delicious. I too feel the same about the usual mayonnaise — too overwhelming; too gelatinous almost! I really have never ever enjoyed it with anything other than a tad in some tuna salad. But this, this sounds incredible and I look forward to trying it soon. Found your great blog from the inbound link you provided on this entry. Thanks for linking to my site. Great recipe you’ve got there. My recipe isn’t exactly a purist recipe, it’s just different. Yours is equally valid, and probably much more common. The shawarma shop in Aleppo would probably be using your recipe instead of mine. I think the addition of the egg white makes for a much lighter and fluffier version than mine, which is more similar to mayo. It sounds good! 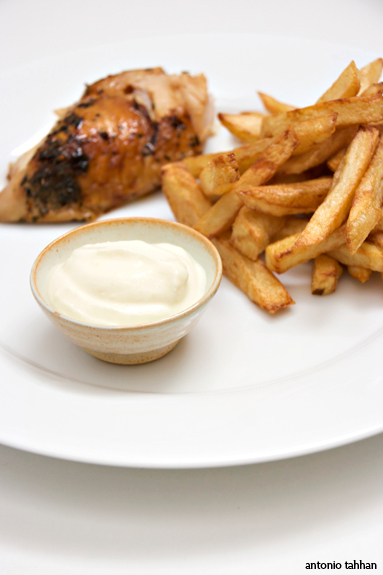 But I find myself staring at the chicken and pommes de frites more than the sauce! I have to try this recipe for toom. I make mine with too much garlic, since it is so good for you and all and it is hard socially to be a garlic lover! Ooh, I love garlic sauce! 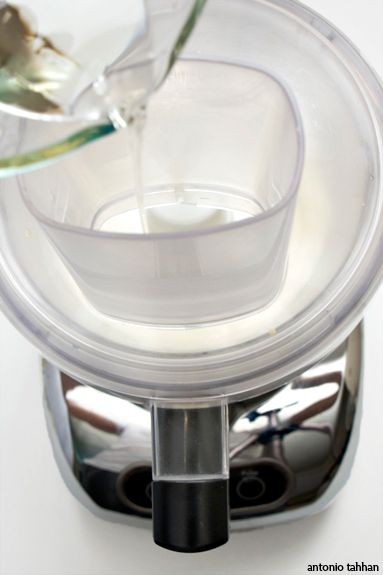 Yours look absolutely fabulous: what garlicky goodness hiding inside that white smoothness. Mine looks slightly lumpy. Suggestions? Hi Tony, thanks for the toum recipe. have you ever stopped on the road from Damascus to Beirut for a lebne sandwich? (a lighter, healthier version of cream cheese for the uninitiated) they have super thin flat bread, some sort of special creamy lebne which they spread with long, flat knives (rounded tips). seems like the shop has been there for centuries and is the best lebne sandwich I’ve had up to that time or since! Arrived here via Lifehacker. I wonder if this shawarma joint still exists. Tragically most of Aleppo has been bombed into rubble. tried it, turned out great. What makes this different from mayonnaise, though?